Integration between Inventory Control and POS can automatically create or update POS items when inventory items are created or updated. It also allows POS sales to relieve inventory. You can print various cost/sales reports as well. Inventory Control can be used for retail as well as for food & beverage including recipes. 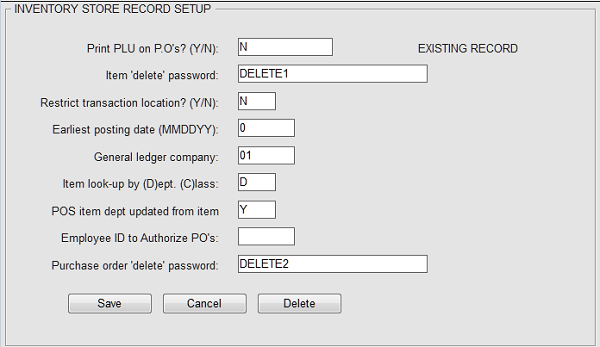 You need to configure both Inventory and POS. Note below that the "POS Department" is designated for this class/category. The POS Department is the Revenue Department in POS, in this case, "b". Note below the setting "Y" for the field, "POS item updated from item:"
Note that the item department in Field 11 is set to the POS Revenue department. The inventory Item Code shown above will create a POS item with the same code, b784. 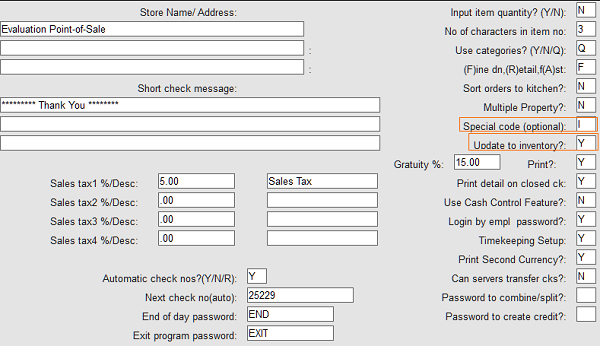 That is because the configuration in this example is set to create the the POS Item Code with the Inventory Item Code. Alternatively your system can be set to assign the "next" POS item code regardless of the Inventory item code. For example, if the last (highest) POS item code is b784 the next POS item will be b785 and then b786, etc. This is designated by a MENUINI configuration setting. The POS Revenue Department "b" matches what was set up in the Inventory Class/Category setup and the Inventory Item setup. The POS Store Record is set to "Y" for the field, "Update to inventory?" 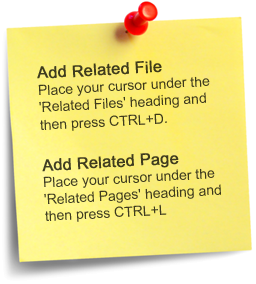 If you will use both a scanner and touchscreen, enter the letter "I" in "Special code (optional)". In the POS Item setup shown below the POS Item Code is the same as the Inventory Item Code. 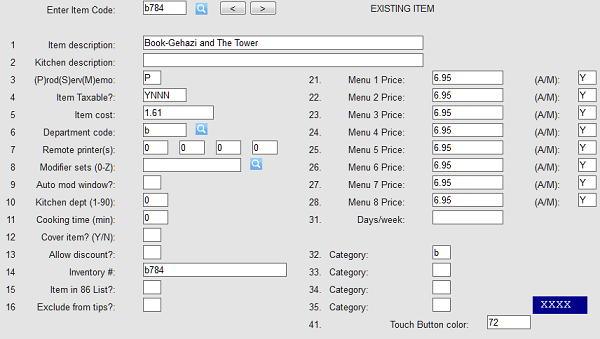 Alternatively your system can be set to assign the "next" POS item code regardless of the Inventory item code. 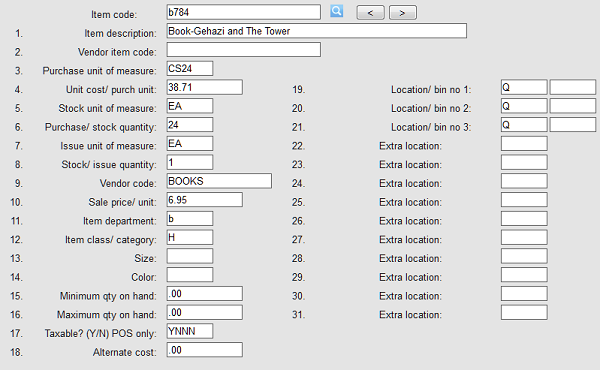 For example, if the last (highest) POS item code is b784 the next POS item will be b785 and then b786, etc. This is designated by a MENUINI configuration setting. Notice also that the "Department code" has automatically been set according to the designation in Inventory. The Inventory item code also has been automatically set. The category default in this case is b. Note that the prices are populated with "Y" in the "(A/M)" field. This means that the item can be scanned but will not show up on the POS screen. This setting should be used when you have a large quantity of items. If you have only a few items (108 or fewer per POS category) and wish them to show on the POS screen, change the "Y" to "A". Alternatively to create automatically all items with "A" there is a MENUINI configuration setting. Note: "A" means the item will automatically be on the POS screen with the pricing shown. "M" means the item will be on the screen but the price will be manually entered each time at the prompt. "Y" means that the item will not be on the POS screen at all. Remember that you have to set they Keyboard (item button setup) for items actually to show up on the POS screen. You also will find optional settings in the MENUINI.FIL Configuration. Professional training is available, both on site and remotely. Contact Execu/Tech for a quote.